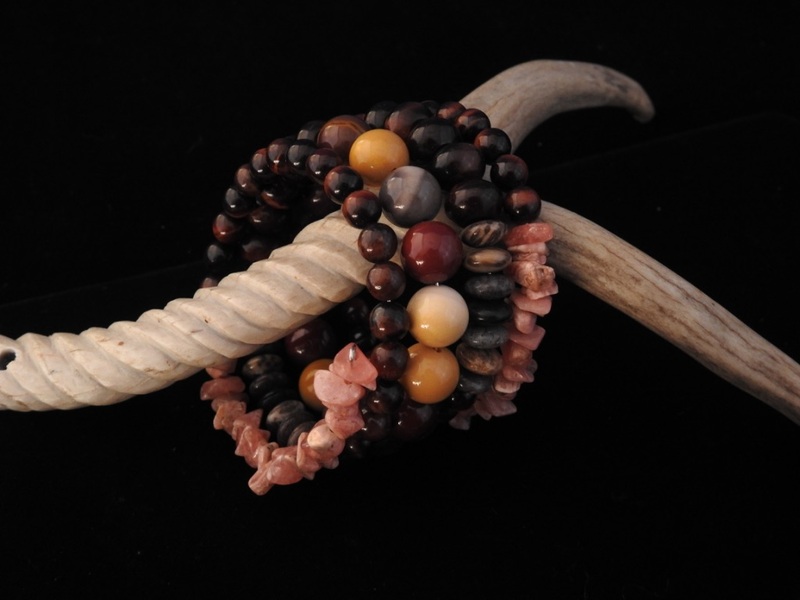 “The Ancestors, the Clans, and the Gifts of the Spirits” Coil Bracelet. $325. The ancestors, the clans, and the gifts of the spirits are all sources of the truth of our existence. With this coil, Wings pays homage to these building blocks of not only our cultures and lifeways but our very selves, wrought in a continuous circle of ancient materials woven with the reds of identity and blood. At either end are small polished nuggets of rhodochrosite, warm pale rose and pearlescent with matrix. They extend into lengths of fiery chatoyant red tiger’s eye, round orbs seemingly lit with the light of the stars, infused with the deep reds of ancestry and history. The clans are represented by earthy doughnut-shaped rondels of fossilized dinosaur bone, impossibly old and ethereally beautiful. At the center lie fourteen spheres, large mookaite beads in the reds of our blood and the golds of earth and light of the indescribable translucent shades of the spirits and the blessings they bestow daily. Memory wire expands and contracts to fit nearly any wrist. Designed jointly by Wings and Aji. First in The Truth Collection, the final entry in The Seventh Fire Series. Posted on Saturday, December 22nd, 2018 at 10:31 am. Filed under: The Coiled Power Collections, The Seventh Fire Series, The Truth Collection	RSS 2.0 feed.